Cleric says "suspicious sources" out to create "differences and separations"
TEHRAN, Iran (CNN) -- After more than two weeks of silence amid Iran's violent election fallout, former President Ali Akbar Hashemi Rafsanjani -- a key Iranian cleric -- emerged Sunday to call out "suspicious sources" who are creating a rift between the public and the Islamic government. 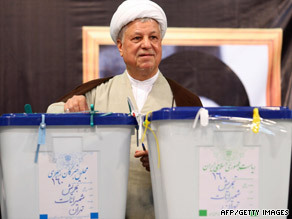 Ex-President Ali Akbar Hashemi Rafsanjani, shown here voting in Iran on June 12, says trust has been eroded. He called the aftermath of the June 12 presidential election "a tangled mess, perpetrated by suspicious sources whose objectives are to create differences and separations between the people and the system and eroding the trust of the people in the Islamic system," the Iranian Labor News Agency reported Sunday. Rafsanjani was speaking to a gathering of family members related to the victims of a June 28, 1981, explosion, in which 70 people were killed at a bombing at the Islamic Republic party headquarters. The explosion -- known as "Hafte Tir," referring to the date on the Iranian calendar -- killed several prominent Islamic revolutionaries, including Chief Justice Ayatollah Mohammad Beheshti. Rafsanjani is chairman of Iran's Assembly of Experts, which is responsible for appointing or removing the supreme leader. But despite the chaos that's plagued the Islamic republic for the past two weeks -- even resulting in the brief detention of his daughter -- he remained silent and largely unseen until Sunday's commemoration. The last time the world saw Iran's assembled leadership was June 19, when at Friday prayers Supreme Leader Ayatollah Ali Khamenei endorsed the victory of hardline incumbent President Mahmoud Ahmadinejad in the hotly contested June 12 election. But Rafsanjani -- who supported opposition leader Mir Hossein Moussavi, a reformist and Ahmadinejad's chief rival -- was missing among the group of Islamic powerbrokers. On Sunday, referring to Khamenei's backing of an extension granted by Iran's election authority to address voting complaints, Rafsanjani said the decision is "valuable in order to gain the trust and conviction of the people in the electoral process, effectively, and I hope those involved in this matter can precisely observe fairness and justice and in cooperation with the candidates so that complaints can be addressed completely." He added, "Wrong actions must not renew hate and differences between the people and all of us must, with cooperation and with one heart, move forward, in order to eliminate obstacles and difficulties." Rafsanjani is a very influential figure in Khamenei's circle, but he's made "a real break with the supreme leader in this case," Hooman Majd, an Iranian-American author, told CNN Saturday. "Whether the leadership will come together again and say we have to solve all of these problems internally rather than have them be public for the sake and security of the government and the system is a question that is an open question," Majd added.